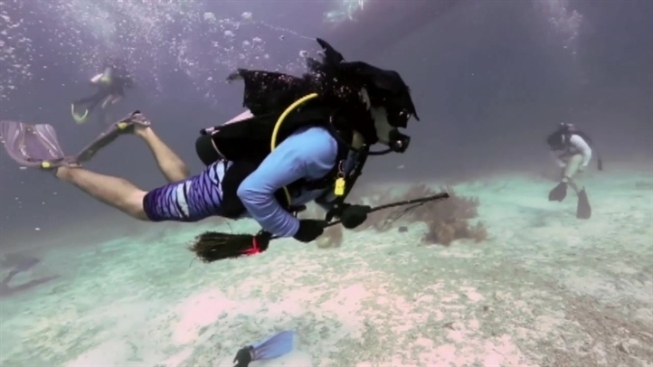 A group of scuba divers has submerged in the Florida Keys National Marine Sanctuary to sculpt jack-o-lanterns during the annual Underwater Pumpkin Carving Contest. Working against the pumpkins' natural buoyancy, artistic divers dove 30 feet to the sea bottom Saturday with knives to pare classic, fun-loving facial features. The contest was staged about five miles off Key Largo. Jana Vandelaar was the overall winner with a pumpkin showcasing a retainer-wearing smile. The Key Largo resident said her creation was inspired by her daughter's braces. The offbeat contest organized by the Amoray Dive Resort attracted more than 30 divers from as far away as Tucson, Ariz.